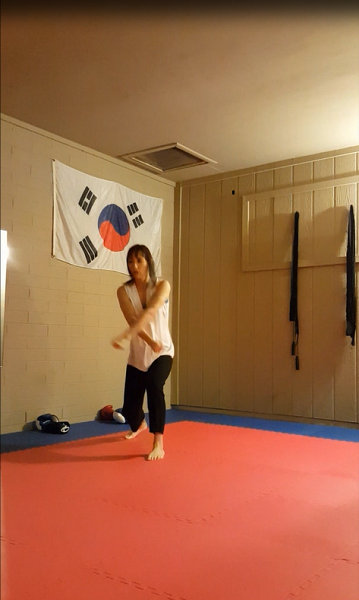 Garage gym updates and Tae Kwan Do techniques! Coming back around to the promised garage gym update! Since our initial setting-up in January last year, we’ve made a few additions to the garage to further its transition into a small but functional training space. We also cleared out the relics that came with the garage when we bought the house – old cans of paint and such. Now we’ve got the basics: 63 square feet of mat flooring (we added a couple of rows of rubber tiles to enlarge the floor), a standing punching bag, an MMA dummy on the floor, a mirror (thanks to Craigslist), a few sets of dumbbells, and speakers (for blasting dub-step, rap, and metal during boxing and Muay Thai training, of course). It’s a great space for the two of us, but as many as four people could train in there at once. Maybe five. Maybe six, depending on what we do. It’s small, but it works. 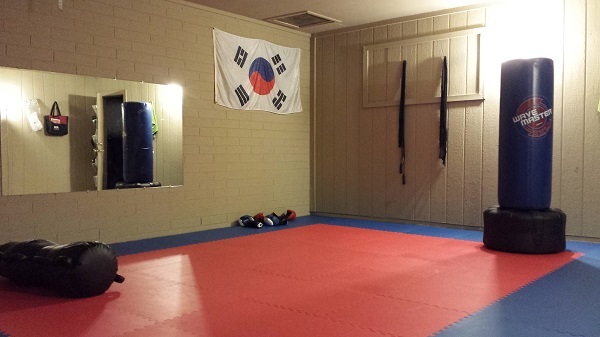 The South Korean flag still hangs in the corner. 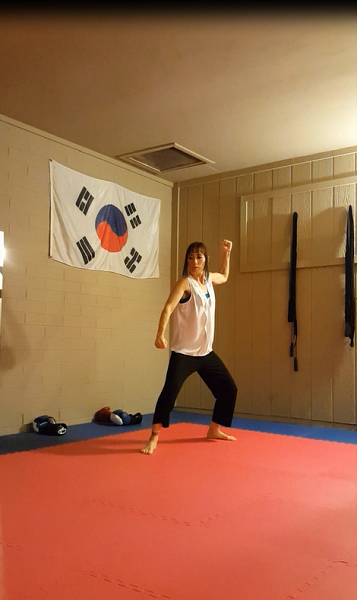 When I go in to practice Tae Kwan Do, I’m entering a do-jang (the Korean equivalent of the Japanese dojo). 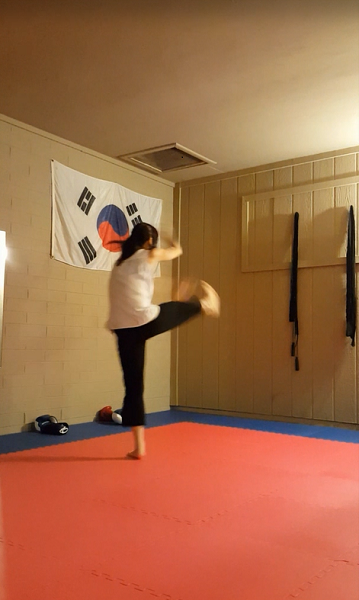 There’s no music during a Tae Kwan Do session. Because of the quiet and the concentration required, I find that it’s akin to a moving meditation practice. I feel at peace. 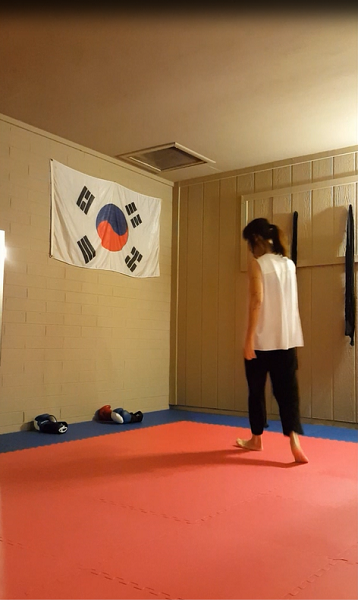 Perhaps more than anything, the flag carries sentimental value, as my Tae Kwan Do master handed it down to me before he moved out of state years ago. Another thing – unrelated, but useful – is that I upgraded my phone last week, so now I’m equipped with a camera that’s much better than my old one! 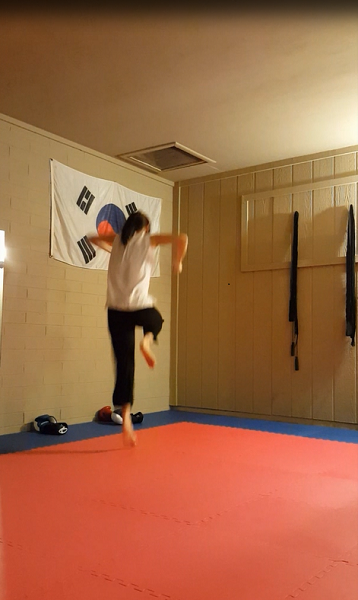 So, with this new phone camera, thinking of how I could show what the space can accommodate, I decided to record myself doing a Tae Kwan Do form (hyung in Korean; kata in Japanese – this is TKD, so it’s hyung). 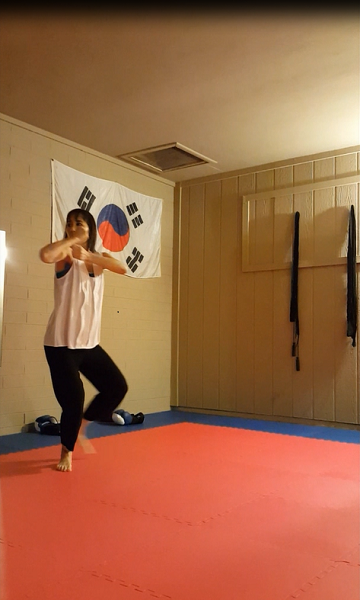 I recorded the video on Sunday afternoon and used “pause” and “the snippy tool” to get the slew of Tae Kwan Do technique selfies posted here. But first, observe the quality difference between my old and new cameras! Home gym in the garage, one year later. 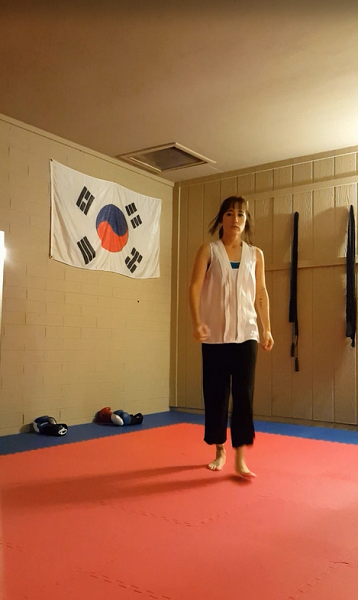 I clipped this shot out of the video, so I’m blurry in movement, but notice the colors! The lighting in the garage was exactly the same in both images, and as per usual, there were no digital shenanigans involved to alter the pics. I’m in love with this camera. 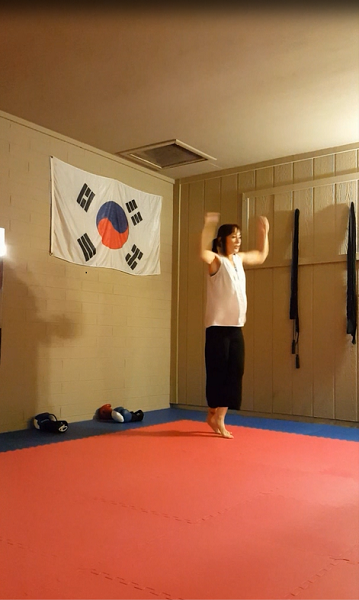 The phone part is pretty great, too, and yes, I’m totally raving about a Korean phone in a post about Korean karate. Coincidence. Note that my feet are slightly too far apart in that finish. 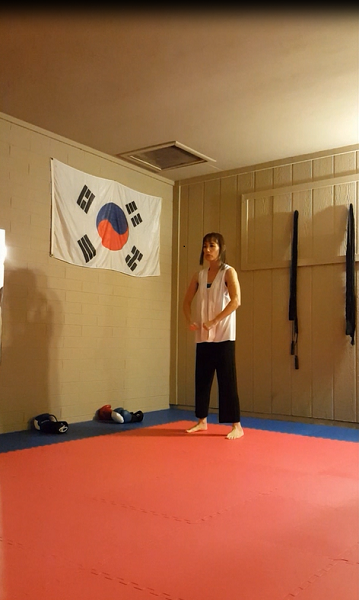 I saw ALL of my mistakes while watching the video and pausing on the techniques, which makes the recording a valuable practice I should continue. 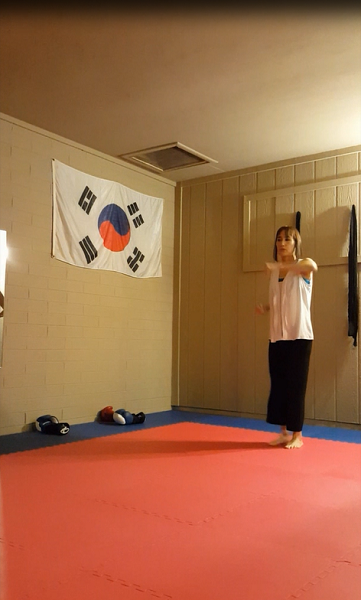 You may see more training pics here in the future. Just a head’s-up. Anyway, our garage gym figures beautifully into my New Year’s resolution to get stronger. We’re going to add three or four sets of dumbbells to our little collection, so we’ll be able to get in some effective full-body workouts. Gotta love Play It Again Sports! We’re also going to add what we need to keep the space tolerable during the hot months. ← Because “resolution” without the “re” is SOLUTION. Hard to work out w/o rap. 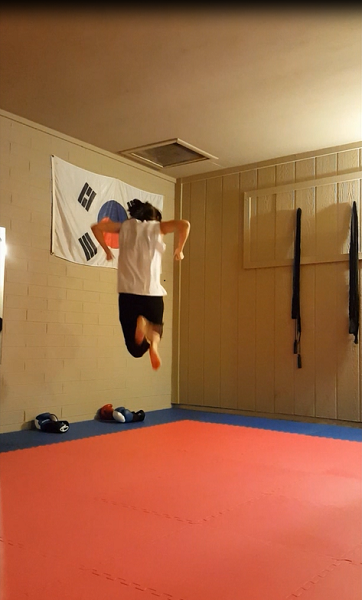 Good vertical on the jump. Use the mirror on the weights. Full range of motion and isolate on the muscle group you are working on. Absolutely! I love gansta rap while working out (though I do throw some mellow Kanye into the mix every once in a while). The mirror is going to be essential for the weight-training. It’s our most recent acquisition, and now the garage *really* feels like a work-out space. Thanks for the tips, Bob!